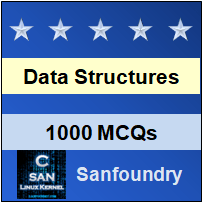 This set of Data Structures & Algorithms Multiple Choice Questions & Answers (MCQs) focuses on “Ternary Heap – 2”. 1. What is the time complexity for inserting a new item in a ternary heap of n elements? Explanation: In order to insert a new item in a ternary heap data structure having n elements, the heap has great efficiency for inserting them. So the time complexity for worst case is found to be O (log n/ log 3). 2. Is decrease priority operation performed more quickly in a ternary heap with respect to the binary heap. Explanation: Ternary heap is a type of data structure in the field of computer science. It is a part of the Heap data structure family. Due to the swapping process, the decrease priority operation performs more quickly in a ternary heap. 3. What is the time complexity for decreasing priority of key in a minimum ternary heap of n elements? Explanation: In order to decrease the priority of an item in a ternary heap data structure having n elements, the heap has great efficiency for decreasing them. So the time complexity for worst case is found to be O (log n/ log 3). This is due to the upwards swapping process. 4. What is the time complexity for increasing priority of key in a maximum ternary heap of n elements? Explanation: In order to increase the priority of an item in a ternary heap data structure having n elements, it performs upwards swapping. So the time complexity for worst case is found to be O (log n/ log 3). 5. What is the time complexity for deleting root key in a ternary heap of n elements? Explanation: In order to delete a root key in a ternary heap data structure having n elements, it performs downward swapping. So the time complexity for worst case is found to be O (3log n/ log 3). 6. What is the time complexity for increasing priority of key in a minimum ternary heap of n elements? Explanation: In order to the increasing the priority of key in a minimum ternary heap data structure having n elements, it performs downward swapping. So the time complexity for worst case is found to be O (3log n/ log 3). 7. What is the time complexity for decreasing priority of key in a maximum ternary heap of n elements? Explanation: In order to decrease the priority of key in a maximum ternary heap data structure having n elements, it performs downward swapping. So the time complexity for worst case is found to be O (3log n/ log 3). 8. Do ternary heap have better memory cache behavior than binary heap. Explanation: Ternary heap is a type of data structure in the field of computer science. It is a part of the Heap data structure family. Due to the swapping process, they have better memory cache behavior. 9. What is the time complexity for creating a ternary heap using swapping? Explanation: Ternary Heap can be formed by two swapping operations. Therefore, the time complexity for creating a ternary heap using two swapping operation is found to be O (n). 10. Which of the following is the application of minimum ternary heap? Explanation: When working on the graph in the computer science field, the Prim’s Algorithm for spanning trees uses a minimum ternary heap as there are delete operation equal to a number of edges and decrease priority operation equal to the number of vertices associated with the graph.